As Amazon Web Services -- the retailer's massively profitable cloud-computing arm -- has grown larger, it's become harder to keep a regular weekly meeting running smoothly. And so AWS turned to The Wheel, which leadership spins to choose a manager (or several) to present at the weekly meeting. It means every manager has to be prepared to present -- while also limiting the length of the meeting. Amazon is famous for trying new things to keep its meetings orderly and productive. CEO Jeff Bezos keeps meetings small by encouraging the "two-pizza rule" -- meaning never have a meeting where two pizzas couldn't feed the entire group. But that becomes a huge challenge as Amazon continues its relentless pace of growth. For instance, a new blog entry from Amazon Web Services, the massively profitable cloud computing arm of the online retailer, details how the division had to come up with a clever solution to keep a regular weekly meeting productive as things grew out of control. For years, the blog says, AWS has held a regular meeting between senior leadership and individual product groups, with every manager sharing metrics and other updates in a 15-minute slot. Yet as AWS has grown from two services to 120 "it has become a big meeting." There's simply not enough time for everyone to present. And yet AWS wanted to make sure everyone came to the meeting totally prepared, even if they weren't officially scheduled to talk. "A simple roster would have ensured that every team reported regularly, but we wanted every team to be prepared to report every week, and their leaders to know the details (whether or not they were called to present in the big forum)," the blog reads. "And thus The Wheel was born." 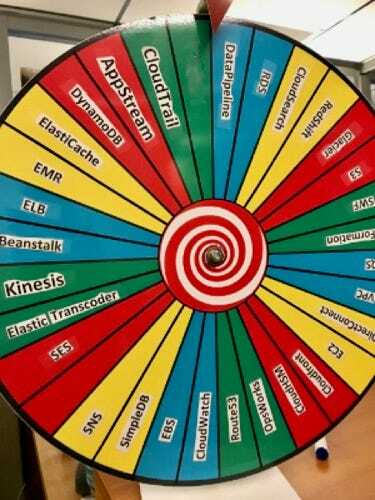 The Wheel is what it sounds like: a roulette-style wheel with the name of all the product groups on it. Each week, the wheel is spun at the start of the meeting. The lucky (or perhaps unlucky) manager of whichever group it lands on is called on to present. Originally, it looked like you see in the picture at right. Nowadays, though, The Wheel has become a software project. Not only that: You can download it and try it for yourself, filling in your own spots on the wheel. Who knows, it could help you make your next dinner decision. Either way, The Wheel is a neat look into how Amazon keeps the figurative and literal wheels turning, even as it gets bigger and the meetings get more crowded.